putting his talent to good use at Davy Down in North Stifford. 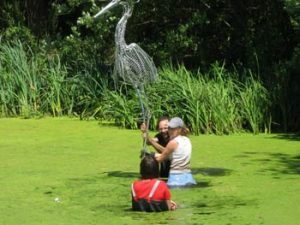 Materials collected from along the Mardyke Valley have been turned into sculptures of creatures associated with the valley — a dragonfly, fish, kingfisher heron andeven the Aveley Mammoth. The mammoth work features the head of the prehistoric animal and is made totally from pieces of old motorcycles welded together, giving the appearance of the mammoth’s head emerging from the undergrowth. 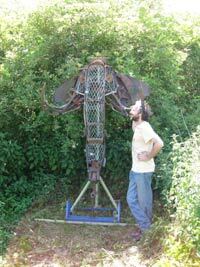 It was inspired by the discovery of a prehistoric mammoth’s skeleton in the Aveley area in the 1960s. Ptolemy has been using the North Stifford Pumping Station at Davy Down as his studio to construct the work. The Mardyke Valley Project is a partnership of Thames Chase, Thurrock Council and others. It is entirely paid for by external funders such as the Heritage Lottery Fund, the East of England Development Agency, the Veolia Trust and the Rail Link Countryside Initiative. Among the work already carried out as part of the project is the surfacing of the existing bridleway and the creation of reed beds and vole banks to increase the environmental interest in the valley. Cllr Garry Hague, Thurrock Council’s Cabinet member for Strategic Planning — including the environment — said: “Davy Down and the Mardyke Valley as a whole are wonderful areas, seas of tranquillity in an almost urban environment and I would urge anybody who hasn’t been there to pop along and have a look for themselves. The Mardyke Valley Project also has an education and outreach section that has presented numerous events. The Mardyke Valley, including Davy Down Riverside Park, are open to the public free of charge with some limited car parking at Davy Down off Pilgrims Lane, North Stifford.